Interesting - an ecologically sound game from McDonalds! Now this is a strange cookie. Here we have possibly the world's biggest fast food chain, who every day produce millions of individually wrapped burgers and a cardboard-packaged French fries, sponsoring a game about cleaning up the planet. Is this an attempt to assuage a guilty conscience, or is there something in their new-found "green"-ness? About as close as most of us ever get to being environmentally friendly is recycling the odd aluminium can, or buying CFC-free aerosols. Global Gladiators takes it all a stage further. While sitting in their local McDonald's reading the latest copy of Global Gladiators (the magazine for the truly sad burger junkies with no life whatsoever) our heroes Mick and Mack received a bizarre visitation. Nothing supernatural... just Ronald McDonald, that highly humourous clown who never fails to tickle;s one fancy. Anyway, whether or not they're as eager as Ronal thinks they are to make amends for the masses of paper they've wasted in their all-too-frequent forays to their favourite fast food emporium, they've set out to purge the earth of slime armed only with some weird green guns. In exactly what way slime is contributing to global environmental problems I'm not sure, but anyway, that's where you come in. You have to lead one or other of the cheeky chappies across numerous scrolly landscapes shooting slime and slime generators, collecting McDonalds "M" signs, and avoiding falling in pools of some acidic substance. Yes readers, it's a platformer with shooty overtones. Before you turn the page in disgust though, it's not as bad as it sounds, because Virgin have made quite a good job of it. The graphics are nicely done and your character is very well animated. He's also an athletic soul, being able to leap about, fire his blaster at all sorts of angles, and so on. When you're not actually moving him around, he'll happily chew away on some bubble gum, or prime his gun for action, or spin around on his finger. The nice backgrounds make the whole game look stylish. The music's quite good too. The whole program is exceptionally well programmed. The levels are pretty large, if fact they're a lot burger (sorry) than you'd expect. Because you're also up against the clock, you'll probably find some of the levels pretty taxing. You can't finish a level until you've collected a size-able amount of "M" arches, so when you find yourself hunting for just one more arch with 30 seconds left the game can become quite frantic. While not radically different in game style to any other platformer ever, it is a slick example of the genre and will certainly appeal to fans of arcade-style romps. A playable and well executed little excursion into a genre that really can't be improved upon much more. That said, this is still a title worthy of a place in many people's collections. Mick and Mack. Mack and Mick. Just a couple of regular gum chewing, gun toting kids. Except these kids are on a mission. It is a dirty world out there - needs cleaning up. Multi-racial harmony is their aim. Polution, all around. Sometimes up, sometimes down. But always around. Slime World first. Hell of a place, a sort of slimey Fungus the Bogeyman land. Everything's gone a snotty shade of green. Now a short word of our sponsor. "Ladies and Gentlemen, boys and girls, are you at a loose end? Need a bite to eat? Then why not go own to your local McDonald's fast food store, nutritious food our specity. McDonald's burger, McDonald's fries, McDonald's Cola (and a piece of pie) - a sure remedy for all your ills. With service friendly, and toilets clean. McDonald's is somewhere for you, your friends and family to cherish for evermore". Ooh, sounds great. And so the kid sets out. Only one mind. You annot be Mick AND Mack. Heck, what do you think this is? Zap. Gotta a bit of slime there. Whoa! What's that? Flying slime. Zap. Not flying any longer. And the thing is, this zapping is fun. Sure you take a bit of slime on board now and again, but hey, it is all part of the game. But I am telling you man, the feeling of zapping those slimeballs is nearly as great as the taste of those damn burgers. And there sure are a lot of platforms out there, and collecting those McDonald's arches is getting tough. Got to the end of the level once, but the guy in the clown outfit says I gotta get more before he will let me though. What a drag. Well it ain't that bad 'cos you just turn around and charge back into action. And check out the speed when you're on full revs. Head down, hot diggity dog that's fast. But don't get too cocky because problem is, you're often running along, you take a leap and you don't know where you're gonna land. Now friends, some might say that this is not cool. I mean, who wants to land in a slimey pond when they could be taking in a chocolate shake? But I think it makes it kind of interesting. OK, you can go down wailing, but you get up off the ropes and get going again. "Kids, we at McDonald's like to think we give you guys more than just burgers. In conjunction with Virgin Games, we have given you kids a platformer you can be proud of. We've put the P back into platform. You want cute? This is goddamned cute. And you want eco-friendly? Heck, this washes whiter than Persil - it is stronger than dirt". So you have done them in cold-slime, but it ain't over until the guy in the clown suit waves his flag. And then you have only cleaned one level of one world. There's whole heaps more. Head for the forest and blow away some animals. Hey, that's not cool surely? Alright, so they're chucking things at you, but blowing them away seems a bit harsh. I thought they were conker-chucking monkeys. Still, what's a guy gotta do, but watch the streams where mad fish with jaws the size of Jaws snap at you. So what else do you do? 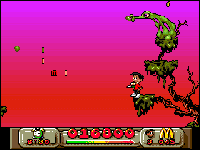 What more can I say - it is a perplexing platform game and you jump around loads, shoot and collect things. That is what you do in platformers. Head off for Toxi-land and do battle with dustbins (garbage cans sounds more appropriate), pneumatic drills and various other nasties, and then on to Arctic World with snowball-chucking polar bears. Sounds easy? Well it ain't. The levels are quite large and the baddies keep on coming. So what if the scrolling does lurch at times, and that you occasionally commit suicide because you are jumping blind. Forget about the McDonald's propaganda (go on, admit it, you would not mind a burger - just a little bite) and get out on the ball park and play the game. A slime-zappin' conker-crackin', bin-bashing', bear=biffin' humdinger. Loads of levels and four worlds with a 'special' bonus level to boot. The sprighthliest sprites this side of Spritesville, Spritesland. Some might find the blind-jumping off the edges a bit annoying. Wer glaubt schon, daß dem Fast-Food-Riesen McDonald's der Umweltschutz am Herzen liegt? Wenige, deshalb hat man mit diesem Spiel den werbewirksamen Beweis angetreten - zunächst am Mega Drive, jetzt auch am Amiga. Der Konzern-Clown Ronald beamt die bereits aus "McDonald Land" bekannten Hamburger-Freaks Mick und Mack in eine vier Levels (à drei Unterabschnitte) umfassende Plattformwelt, wo sie den ansässigen Umweltverpestern bessere Manieren beibringen sollen. Unter Zeitdruck kämpfen sie sich durch die Schleimlandschaft, den Wald, eine Großstadt und die abschließende Eishöhle, um die Gegend mit einer feuerspeienden Kanone zu säubern. Zum Sammeln gibt es neben Zusatzleben und Zeitboni vor allem Firmenlogos; wer am Ende eines Abschnitts zuwenig davon vorweisen kann, wird gnadenloas zurückgeschickt. Am Ende des ganzen Levels folgt eine immer gleiche Bonusrunde, bei der von oben herabfallende Dosen, Papierfetzen und Flaschen im passenden Container landen müssen. Alles sehr löblich und auch ganz nett, aber mehr halt nicht. Denn fast alle Spielelemente sind alte Bekannte, man kann auch immer nur mit einem Helden losziehen, Teamarbeit ist verpönt. Zudem ist der praktisch angewandte Digital-Umweltschutz selbst auf der niedrigsten Schwierigkeitsstufe hochschwer! Die putzige Grafik scrollt sauber in alle Richtungen, hat aber so ihre Tücken: Sobald sich das Sprite umdreht, rutscht das Bild schlagartig ein Stück zur Seite - falls das während eines Sprungs passiert, ist es um die Orientierung geschehen. Schließlich ist bei der Konvertierung auch eine der beiden Scrollebenen verschwunden, während die FX und die (anwählbaren) Rap- und Techno-Musikstücke nach wie vor toll klingen. Fighting pollution and promoting hamburgers, Virgin and McDonalds serve up a tasty platformer - with a difference you'll enjoy. My word, another McDonalds tie-in. We've already had the distinctly average McDonaldland platformer from Virgin, and now the fast food-sters with the disturbing clown mascot (am I the only person who's frightened by Ronald McDonald?) are in our face again with this Mega Drive conversion. Can you tell you're in for a product-endorsing, '80s-style hard-sell because there's paragraph at the beginning of the manual - which has got that little ™ mark after every word. It really is in your face too - Mick™ and Mack™ are sitting in their local McDonalds™ emporium, which sits atop a lovely green, unpolluted grassy knoll where the sun always shines and the Ozone Layer™ is totally intact. They're eating hamburgers™ and fries™ voraciously and poring over their Global Gladiators™ comic and saying things like "Wouldn't it be groovy to be a Global Gladiator™?" when all of a sudden, up pops Ronald McDonald™ himself, from nowhere (told you he was scary). "So you fancy a blast, eh guys?" he rasps through rattled teeth (sorry, that's my characterisation), and zaps them into the comic. Git. Next thing you know you're in Slime World™, armed only with a GooShooter™ dust-busting your way through the ecological horrors of the world, cleaning up pollution, and picking up tons of McDonalds™ Arches™ on the way. Hmmm. Now, it would be easy, you know, to just sit here and write some embarrassingly cringe-worthy right-on polemic about how McDonalds has no right to lecture us about the dangers of toxic waste and un-ecological attitudes towards pollution. Especially since... no, I'm sorry, it would be too easy. I'm prepared to accept that they have a genuine concern towards the planet's ecology, and let's face it, who else is putting ecology on the agenda in their platform games? Nobody, that's who. Well. Oh sod it, just give me a paragraph. You see it could all be a McDonalds marketing ploy, not only to tie their product in with a computer game, but also shift the public's perception of the company from that of destroyers of rain forests with a nice line in non-bio-degradable cartons to right-on soldiers of ecology, democracy and the American dream. I'll leave you to decide, and apply myself to the task of playing this game and telling you whether I think it's any good or not (Hey, revolutionary concept, Tim! - Rapidly-Losing-Patience Ed). 'Nuff said. Now, where were we? Ah yes, Slime World, the first of four worlds, each with three levels. Yes it's a platform game, but here ends my hiherto admittedly-cynical tone, because it's a very good one. And one of the freshest on the Amiga in fact. First off, though, a disappointment. You're given the two options of playing either Mick or Mack, but not (as you might expect) a two-player option featuring both of them. What a shame. They both have totally similar attributes too, so the only difference is that one's black, the other is white and they've got different colour T-shirts on. Is this a race thing? Weird. Whichever you choose, you're going to have a great time bouncing him around this excellent game. The animation of the character is superb, and the by-now-accepted tradition of platform characters being active even when you're not moving them is superbly implemented. Mick (or Mack, obviously) gives you some groovy looks (especially when he stands on an invisible platform - it's really funny), snaps his gum, spins his GooShooter and generally looks like a real little man who's actually alive (Do you want to take some time off, Tim? - Ed). The pace of the game is fairly leisurely, but you can also build up an impressive speed when you need it. The baddies are in severe proliferation, and they are all wonderfully characterised, including my favourite, the Slime Pig, the lovely Goober, a pneumatic drill with a face called Jack (that is, the pneumatic drill's called Jack, I don't know what his face is called), and a trash can who chucks all manner of garbage at our heroes. You need to collect 30 Arches to get out of the level, and if you collect 70 of them you get to play the Bonus game for extra points. The Bonus game is a real treat, involving you running around catching falling litter and depositing it in the correct litter bin (Wahey! - Ed). It's pretty tricky, but thankfully there's a menu option which gives you the chance to practice it. The levels are extremely well-designed too. They're all fairly large, in some cases huge, and there's always something else to explore, or a different route to take through the same level. There are three difficulty levels, but even on Easy you'll find it a fair challenge, and it'll certainly keep McDonalds at the forefront of your mind for quite some time (ooh dear, bit of cynicism there). The graphics on all levels are suitably toxic-looking, but I have to say I do miss the gorgeous backgrounds of the Mega Drive version. Not for their own sake, you understand, it's just that there are times when you're out on a limb with no other platforms nearby and there's literally nothing to offset the action. It's a bit disorientating seeing your character leap into empty space, with only a graduated backdrop providing any sense of perspective. Still, if it meant sacrificing the speed or the animation, then the programmer has made the right decision. Talking of jumping into empty space though, there are more than the permitted number of suicide jumps in the game (according to our guidelines outlined in AP's "How to write the perfect platformer"). A suicide jump is one in which you have no idea what you're jumping into because the screen won't scroll down to show you. Half the time you land on a platform, but the rest of the time you end up in the drink, on a spike or straight into the arms of a baddie. This is not fair, and I don't like it. Admittedly, familiarity with the game improves the situation, but it's still not a good thing, so I'm going to dock, ooh, 7% off the final mark for that. But let's not stray from the main tenet, which is that Global Gladiators is an excellent platform game, an extremely faithful conversion from the Mega Drive and well worth your cash - and even if you are fed up with platform games. Forget any political correctness factors, McDonalds aversions or platform fatigue and just concentrate on enjyoing this fabulous romp. And forget about that nasty scary Ronald McDonald fellow too. UPPERS Brilliant animation, great graphics, slick gamepaly, endearing characterisation, large involving levels, exciting product tie-in (well, you know...) - where do I stop? It's exactly the same on the 1200 (the scrolling's certainly no smoother). How about a version with enhanced backgrounds, eh? As his desk is an avalanche of empty coke cans, books and dirty laundry, we thought John Mather was the best candidate to review Virgin's new dirt-busting environment conscious blockbuster. virgin's first attempt at exploiting the McDonald's license - the thoroughly miserable McDonaldsland - was such a stinker we did not even bother reviewing it. Happily, their second stab at the license is a much more playable affair. Global Gladiators once again features the exploits of Mick and Mack. This time, the two pals are tucking into a meal at a McDonald's restaurant, reading the latest Global Gladiators comic, when they are suddenly transformed into the comic book heroes by Ronald McDonald and transported to McDonald's Land which has been taken over by some evil slime-monsters who are spewing out a deadly tidal wave of gunge. 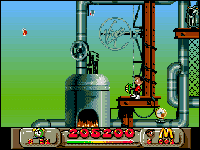 To save the day, Mick or Mack must run or jump about the game's four worlds, made up of three levels apiece, destroying the alien invaders and thus preventing them from turning the world into one big toxic waste dump. Each character comes equipped with a Gooshooter, a marvellous device which churns out an endless supply of a gunge-destroying substance making short work of any alien nasties that get in the way. Each world is built around a particular theme. Slime World is full of globular-shaped nasties which wibble and wobble all over the place, spewing out a torrent of green slime at anyone who comes near. The platform-packed scenery is made up of grassy hills and outcropping cliffs with deadly gunge-filled pits lying in wait if you lose your footing. The Mystical Forest levels throw up their own set of nasties int the form of wood-chucking beavers, man-eating plants and murderous axes that literally fly off the handle at the slightest provocation. The most testing obstacle are the bees' nests - once shot to pieces, they unleash a swarm of bees which follow you around. Further on, Toxi-Town features a series of interconnected steel girders, moving conveyor-belts, lifts and other obstacles. On the prowl are pneumatic drills, mutant trash cans that throw out a deadly diet of broken bottles and other such rubbish, and toxic clouds that split into smaller particles once hit. Finally, Arctic World is set atop a series of snowcapped mountains and glaciers, and features some cute-snowball-chucking Yetis as well as polar bears and snowstorms. As well as destroying the littering louts that infest each level, there are also a number of McDonald Arches to pick up. Once you have collected 40, Ronal McDonald appears to wave you through to the next stage of the game. Pick up another 30 though, and you gain entry to a special bonus level. This involves collecting various bottles, cans and newspapers as they fall to the ground and depositing them in the correct recycling bins for bonus points galore. Mick and Mack possess an amazing repertoire of facial contortions and, if left to their own devices too long, they will blow a bubble with some chewing gum, spin their Gooshooter around in their hand, or a zillion other set pieces. Even better, though, is the mass of sampled speech and sound effects that have been included. Collect an energy-giving heart and you get an 'Awesome, dude' greeting blaring out of the speakers, with similar phrases littering other parts of the gameplay. Unfortunately, the game fails to deliver in a number of departments. For starters, it is only a one-player game, so you can play either Mick or Mack, but not both together. More importantly, the whole shooting match is too easy. 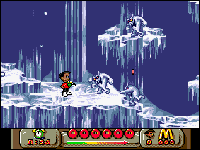 It is possible to romp through the first two worlds in a couple of hours, and I reckon that most CU AMIGA readers could complete the entire game within a day if they put their minds to it. It is rather like buying a Porsche and finding that it is equipped with a Mini's engine. Global's graphics are certainly stunning, but the gameplay is not in the same league. There is also a problem when Mick or Mack's sprite is flipped over - the on-screen view changes to show the area directly ahead of the sprite, so things can become confusing if you have to quickly change directions a number of times. That is not to say Global Gladiators is a bad game. If you are new to platform games, you will get a kick out of it, but the more experienced players amongst you should look elsewhere. Certainly looks the business, but the gameplay is too easy.